Tell us about the India Wine Awards (IWA). As IWA chairperson, how do you see India’s importance on the global wine map? The second edition of the 2018 India Wine Awards will be bigger, better and shinier. It is a world-class wine competition that recognises, rewards and celebrates the best of the wines, Indian and international, available in India. The glittering awards night ceremony will be held on 29th of September at the grand ballroom of The Leela Mumbai. It will be attended by distinguished guests, members of the media, leaders of hospitality, indigenous wine producers, importers and distributors of international wines and all the luminaries of the food and beverage industry. The response is incredible, we have received more nominations than last year. A 2-day wine competition of world-class standards will be held on 18th and 19th of September 2018 and judged by India’s most credible jury of wine and hospitality professionals. A unique food and wine pairing competition, where signature Indian dishes are paired with wines to decide winning food and wine combinations, thus allowing winning wine brands to position themselves as food compatible among curious consumers and interested hospitality professionals. We have nine signature dishes more than last year’s six signature dishes. This year, for the first time, we will introduce a new segment of awards; Excellence in Wine Programs across the luxury hotels and premium stand-alone restaurants in Mumbai, Delhi and Bangalore. This unique segment of awards will be judged independently by international wine experts; five Masters of Wine from across the globe will review and judge the best wine lists, wine service teams and events in the country. We will be unveiling at the India Wine Awards ceremony, the second edition of India Wine Insider 2018, a consumer research report with more comprehensive in-depth analysis of the urban Indian wine consumer on his awareness, attitudes and usage of wine. The wine industry currently is nascent yet rapidly growing. For the last decade, wine consumption in India has been growing consistently by around 15%, making it the fastest growing beverage in the country. Increased availability of domestic and imported wine brands increased international exposure and growing urbanisation and affluence is spawning tremendous interest in wine among consumers. Wine is perceived as a sophisticated, classy drink and perhaps a healthier alternative when consumed in moderation, also making it more socially acceptable among female drinkers. All these reasons, wine is increasingly becoming a mainstream drink, being consumed at home as well as restaurants. Yet, consumer awareness about various grape varieties, brands available and knowledge of which wines to drink, remains low. There is a need to enable consumer choices by showcasing the best of what is available in the country. The India Wine Awards competition results will offer the Indian consumer the ultimate guide to purchasing wine, and winning brands an enviable advantage in the marketplace. We believe that India Wine Awards will help further the wine industry’s overall macro objective of bringing more consumers to wine and in strengthening India’s importance on the global wine map. Brief us about the wine sector in India. How has it grown over the years? 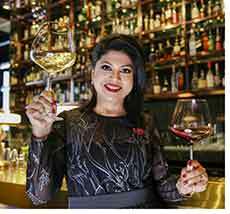 Where, according to you, are Indian wines lagging behind when compared to those in the West? As far as Indian wines are concerned, they have been improving greatly over the past few years. The more serious wine producers continue to invest more time, technology and passion in the craft and yet a few others are struggling with how to market their wines effectively. Over the next few years, we may see some consolidation in this sector and also some fresh foreign investment coming into the country in the line of wine production. Overall, Indian wines need to focus on getting better quality fruit in the vineyard that can ultimately lead to higher quality wines in the glass. As the first person in India to achieve the MW title, what have been your biggest challenges, and opportunities? Lets put this into perspective. Statistically speaking, there are less than 400 Masters of Wine in the whole world, accorded by the Institute of Masters of Wine (UK) since its inception in 1955. Interestingly, more people have been into space than are Masters of Wine, today. The journey to becoming an MW is one of grit, passion, commitment, stupendous hard work, and of course, developing an astute palate. The limited availability of wine and tasting opportunities in India posed a real challenge to me and at times, I was perceived to be at a disadvantage when compared to my global peers. To immerse oneself into the world of wines requires significant capital outlay, dedication of time and a great deal of self-motivation. A steely resolve and dedication to master the vinous world, made me travel across the globe to meet viticulturists and winemakers to study the art and science of winemaking. I attended numerous trade fairs and innumerable tastings to develop my palate. Travelling the globe on this arduous journey kept me away from home for long stretches of time, but my family’s unwavering love and support kept me on the path. As a woman, a wife and a mother, this sacrifice weighed a lot on me, but it also strengthened my resolution to become an MW. In September of 2016, my long-cherished dream was realised when I was named India’s first Master of Wine. What do you think will be the biggest changes over the next 10 years in the wine, spirits and hospitality industries in India? Consumer demand for wine will rise. Consumers will seek wines that are enjoyable and delicious, without caring much about appellation or technical winemaking details. Simplified marketing will be key. Wine production may increase beyond the boundaries of Nashik. Global warming issues may cause new producers to search for newer terroirs. Sustainable winemaking practices will find favour among consumers; so will organic wines. Technology will drive how consumers perceive brands and receive knowledge about wines. Experiential marketing will assume more importance. Innovation and design will drive how we merchandise and sell wine. Demand for wine-qualified, competent personnel will increase exponentially. Wine education or certification programmes will be pre-requisite for jobs in the food and beverage department of the hospitality industry. What are the challenges faced by hoteliers and restaurateurs in maximising opportunities in wine and beverage sales? Beverages constitute a growing percentage of overall sales in a restaurant. Hoteliers and restauranteurs have a real opportunity to increase their revenues through a structured wine programme which includes offering an interesting and varied wine selection at sensible prices, have well-trained, competent wine service staff that create unique experiences for their guests. The biggest challenge is the mind-set to make that investment in training programmes or in offering reasonable prices on wine. Luxury hotels continue to have a heavy mark-up on their wines which dissuades consumers from trying different styles of wines. They tend to purchase something they are familiar with (restricting upselling opportunity) or worse still, choose another beverage category. How much is the Indian consumer awareness about grape varieties? Research on India Wine Insider shows that the Indian consumer’s understanding of wine is limited at this early stage of our developing wine culture. Consumers tend to be aware mostly about the various wine styles such as red, white, rosé or sparkling. They also sometimes use country of origin as a cue for making a purchase. However, going deeper into specific regions or names of grape varieties are still underdeveloped cues among consumers in India. Among grape varieties, Chardonnay, Pinot Grigio and Sauvignon Blanc among whites; and Shiraz, Cabernet Sauvignon Blanc and Merlot among reds have a higher recall among consumers. What steps, as IWA chairperson, are you taking to increase awareness about them? Since its inaugural year in 2017, India Wine Awards aim to enable consumer choices. In a nascent market like India, where consumer awareness is relatively lower than other developed countries, our awards empower consumers with the ability to make more informed choices with their wines; making the process simpler less daunting and enjoyable. We believe there is a need to enable consumer choices by showcasing the best of what is available in the country. The competition results will offer the Indian consumer the ultimate guide to purchasing wine, and winning brands an enviable advantage in the marketplace. We believe that India Wine Awards will help further the wine industry’s overall macro objective of bringing more consumers to wine and in strengthening India’s importance on the global wine map.